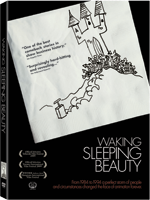 Waking Sleeping Beauty is a story of conflict and creativity. More specifically, it looks at Disney’s animation studio during a pivotal period in its history. Director Don Hahn gives an insider’s view of the famed animation studio as it reached a low point in the 1980s and rebounded in the 1990s. This film will mostly appeal to Disneyphiles, but anyone who loved the studio’s films from that era will find it interesting. The early 1980s was an unsettled time for Disney Studios. After fighting off a hostile takeover bid, a new slate of executives was brought in to lead the company. Disney made money from its live-action films, theme parks, and television properties, but the animation division was a white elephant. (In a 60 Minutes interview, CEO Michael Eisner tells Diane Sawyer that they do animation because they have to.) It didn’t help that the The Black Cauldron was outperformed at the box office by The Care Bears Movie in 1985. The new executives began to look at animation production methods; the artists didn’t appreciate having these Hollywood types question the way things had always been done. But the changes to the studio culture would bear fruit. The Little Mermaid was a surprise hit for the studio, and the Broadway-style musical sequences would set a template for future successes. The movie ends with the triumphant release of The Lion King in 1994. The following year, a new feature animation revolution would begin with the release of Toy Story, and the Disney studio would find itself left behind again. The story is told effectively through archival materials accompanied by Hahn’s narration, and audio interviews with many of the key players. As the producer of several of Disney’s animated films in the 1990s, Hahn offers an insider’s perspective that you won’t find in the making-of featurettes that are ubiquitous on many Disney DVDs. Studio Tours is the most fun of the features. In 1980, 1983 and 1990, Disney animator Randy Cartwright brought his home movie camera to work and gave five-minute tours of the studio. Cartwright appears on camera, introducing various animators (look for Tim Burton in the 1980 segment), John Lasseter operates the camera. Clips from the films were used in Waking Sleeping Beauty. The commentary track features Hahn and producer Peter Schneider, and includes recorded interviews with other participants in the movie. The additional voices fill in more details on working at the studio. Why Wake Sleeping Beauty? (8:45 minutes) has Hahn and Schneider answer that question. Hahn wanted celebrate the people in the animation division who don’t get much public recognition. Ironically, the guys at the top get the most screen time in the feature. There are six deleted scenes, about 35 minutes in all. Four are actually completed scenes. Two are raw footage of lyricist Howard Ashman at work (Ashman and composer Alan Menken won Oscars for their work on The Little Mermaid and Beauty and the Beast). The Sailor, the Mountain Climber, the Artist and the Poet (15 minutes) explains the dedication at the end of the film. Roy Disney (the sailor), chief operating Frank wells (the mountain climber), story developer Joe Ranft (the artist) and Howard Ashman (the poet). All four men were instrumental to Disney’s animation successes in the 1990s. The movie is presented in 1.78:1 aspect ratio, with 5.1 Dolby Digital sound. As the film consists largely of archival materials, both picture and sound are as good as the source material. The DVD has subtitles in English and Spanish. Watch the movie, then check out Studio Tours.